Usually my auctions always start with a low price....but not for this one. Impossible to find it in this condition. No chance. Picture sleeve and vinyl are just like if you'd bought them new in 1977. I'm pretty sure you will not find another superclean original first 'Made In Yugoslavia' pressing in tip-top condition. As you know Yugo-pressings are usually not clean, not even excellent but this one is DEAD-MINT. 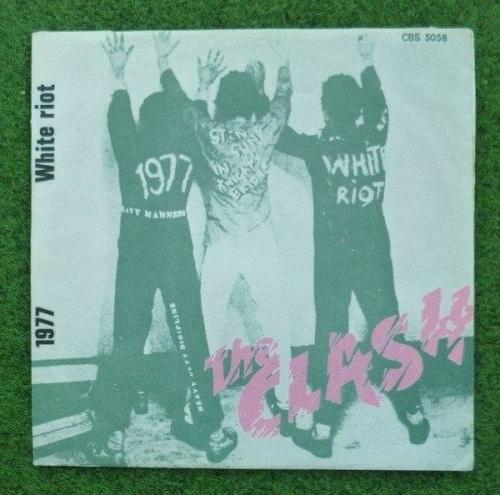 Only this pressing shows the song titles 'White Riot' and '1977' printed on front of the sleeve. As you can see on the second scan ithas the famous sloganIf You Don't Like The Clash You Don't Like Rock 'n' Rollprinted on the rear of the sleeve. Released on CBS/SUZY records in the noble year of 1977 (catalogue number CBS 5058). Again & again, impossible to find in this minty condition. Mailing / Versand: all records will be sent in plain white 7“ sleeves outside of the picture sleeves to avoid any seam splits (alle Platten werden in einer neutralen weißen 7“ Hülle außerhalb des Plattencovers verschickt, um Beschädigungen am Originalcover zu vermeiden). All records will be shipped in special record mailers. Two cardboard paddings (the best) will be used to avoid bending. Ebenso werden alle Platten entsprechend stabil in speziellen Schallplatten-Versandkartons mit zwei dicken Pappkartons verpackt.